Rainwater recycling involves collecting rainwater from a building’s roof or from any other surface, including nowadays permeable pavements and garden lawns. The rainwater then passes through a filter, which eliminates debris, and is stored in a holding tank placed either underground or the side of a building or in the loft. This saved water can be pumped to places where it is needed. Since the water collected by most rainwater harvesting systems in the US is not drinkable (without substantial treatment), plumbing regulations dictate that the collected rainwater be passed through a dedicated pipe system, and not the building’s drinking water system. A water storage or holding tank is needed to store the water collected from the roof or other surfaces. The size of this can vary depending on the space available and what it is used for. It can be buried underground or at the side of the house or building. For a domestic property, the tank will normally be fed by the gutters surrounding the house. A control unit is used to monitor the water level in the holding tank. Some models also provide additional information such as the temperature of the water, pump pressure and fault diagnosing software. A filter is used to stop debris in the water (such as leaves and dirt) from entering the water tank. For most average sized rainwater harvesting devices, different levels of filtering are required depending on the eventual use of the collected water. For instance, the water needs to be of higher quality if it is being used for washing than if it is being utilised to keep a garden. 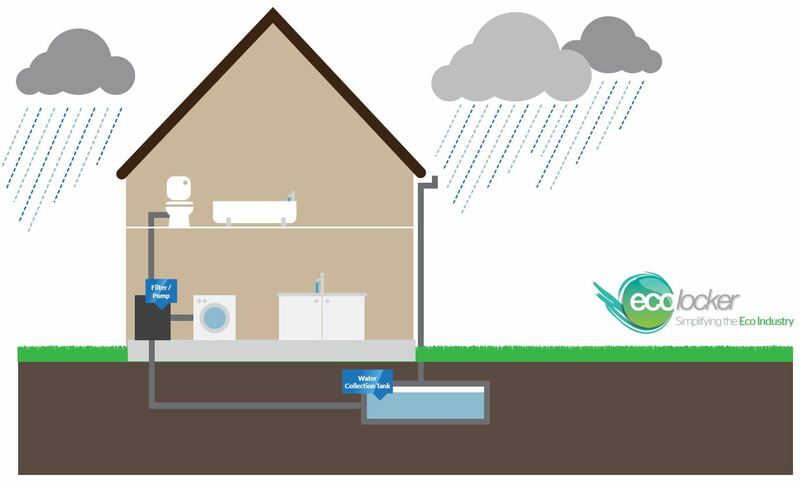 For systems that are buried underground a pump is needed to get the water to where it needs to be used (gravity fed systems will not need a pump, instead using a raised storage tank to feed the water to points of use by gravity – though these are relatively rare for domestic premises). A separate pipe system for your harvested water supply will need to be installed, connecting to areas like your toilet, shower or washing machine. You will, of course, need a backup water supply. As the rainwater collection system will probably not satisfy or be appropriate for all of your water demand, especially drinking water, the building will still need to be connected to the mains supply. There will also need to be backup piping that can cut in if the water tank runs dry, which happens if you have a small installation and a period of low rainfall. Some components of your rainwater harvesting installation such as the pump and monitoring device will obviously need to be mains powered, so this is another factor that needs to be taken into consideration if you are calculating the cost and environmental savings of any project. Many people are now moving towards installing water meters that help reduce the general cost and overall usage, recycling where they can. If you have not already considered one, a water meter can, in fact, help to drastically reduce the way we use one of our most valuable assets. A number of water companies are also providing water saving devices such as valves and shower heads when you sign up to have a meter installed. If you add in the savings that can be made from putting in a rainwater harvesting tank then you could be looking at substantial cost reductions, especially if water companies start putting up their prices. The fact that we use too much water has not escaped the government’s official bodies in recent years. With the growth in population and changes in our climate, we all need to be more responsible when it comes to how much water we use. Rainwater harvesting is now being reinvented for many new builds with the robust guidelines for sustainable housing. At the present time, we all find it easy to switch on the tap and use what seems to arrive in our homes and businesses as if by magic. The future may well see a more sustainable and efficient way of collecting rainwater and combining it with the mains supply to help reduce our overall usage. Other developments that may ease the pressure on our heavily populated urban areas are projects such as permeable pavements that can be used to collect water for washing cars and watering the garden. Discover the many benefits of rainwater harvesting here.